As I have began tackling the beast of organizing the bedroom, I asked myself “What is causing the clutter, and what do I need to do to fix it?” When I realized that the problem is that our bedroom has become an extension of the laundry room, I knew I needed to do something about the laundry room first. I neglected to take a before picture of this room. 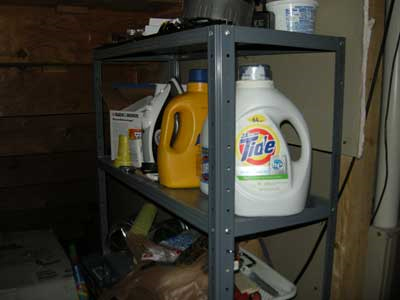 The basic scene was this fantastic shelf you see below, filled with a trash bag for lint and dirty diaper bags, a few warranty papers for the washer, dryer, and water heater, and all of the detergent products. I make homemade laundry soap, so all of the ingredients were stored here. Prime real-estate completely wasted. I realized that the reason I ultimately fold the clothes upstairs is because I want to hang up the nicer clothes before they became wrinkled to save me from having to iron them. Wooden dowel at Home Depot, $4. Scrap wood and tools we already had, Free. Husband with handy-man skills, Priceless. I put the warranty papers in the filing cabinet, I have a trash can for the trash (imagine that! ), and I found a new home for the laundry soap. Now I have a place to fold laundry and hang up the clothes. This is so much easier than how I hung them up before, because the bedroom closet was far away from the bed where I folded the clothes, they would be put on a hanger and draped over the bed before being hung up. It’s a great little station, and it works for me. I also take all the dirty laundry baskets downstairs all at once, and have them “wait in line” on the floor under this shelf. Clean clothes wait to be folded in laundry baskets on this shelf, or on the washer or dryer. I don’t mix them up anymore, and Peter has lost his dress-up opportunity with our dirty laundry. Note: Please forgive the smeared spider web on the wall. It’s behind the plastic, there’s not much I can do about it. Peter helped Michael measure the wood and draw measurements on the wood. What a good Daddy! Michael had a large bit which he measured and drilled to fit the dowel we bought. 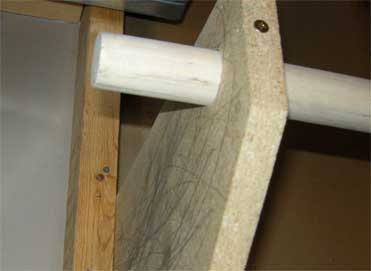 Then he put a screw in the finished product to keep it from slipping out or from spinning. Okay, I have to admit, I haven’t organized this shelf yet. I simply moved enough stuff to make room for the laundry soap. Well, you can guess how often I get into the painting supplies. The shelf will probably have to wait until I have organized the rest of the house before I get to it. It’s just not prime real estate, and it is safely hidden from company. But it is in the laundry room, and at least a small part of it gets used often now, contributing to the flow of a home that is beginning to have some order to it. I think my favorite laundry room solution I have ever seen is that of the Duggar family. They have 18 (almost 19!) children, are homeschooled, and have one of the most organized homes I have ever seen (at least through the media). I really admire Michelle, the mother. They have a family clothing closet immediately adjacent to the laundry room, where all of the family’s clothing is stored. Every mother of a large family whom I have told this idea to says that it is a smart idea that makes sense. 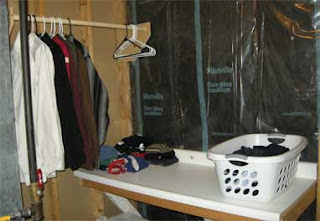 The clean clothes are often sought after in the laundry room anyway, why not make a system of it? In my dream home, I will do this, but our laundry room is in the basement, and our family is still small, so this fantastic solution will have to wait. http://www.duggarfamily.com/photos.html This is a slide show, so if you want to see pictures of the laundry room, you will have to go through other family pictures. It’s worth it though, they have a beautiful home and a beautiful family. Their book “20 and Counting” shares their story. They built this home with cash, and although many of the beautiful things in the home were given to them by media, the home itself and the land it stands on came from years of provident living, wise investments, and working together as a family to achieve their goals. I am truly inspired by this family.